Do you know what your passions are? Have you ever dug into your skills in order to strengthen them? Do you have a deep understanding of what makes you truly happy? These are some common questions we tend to think about in moments of reflection and introspection. It’s normal to feel kind of “lost” because we’ve been programmed to think and live from the outside, based on past experiences. The moment we turn that situation around and start experiencing things from within to without, we will constantly empower ourselves to impact positively in society through our own actions. It’s all about the thoughts we’re constantly flowing with. That’s why it’s time to create a new cognitive frame that allows us to see the goodness in everything and everyone. Indeed, there is beauty in everything and everyone! In our human conditions, we sometimes need people or tools that help us keep moving forward. To gain an important level of auto-discipline, it requires a lot of determination and it’s a great habit to cultivate in any situation. The tools are there, it’s up to us to use them wisely and take all the best from them. There is a great quote to keep in mind constantly: “If you want to teach people a new way of thinking, don’t bother trying to teach them. Instead, give them a tool, the use of which will lead to new ways of thinking” (Buckminster Fuller). That’s what this Self-development Program is. We build the tools and the tools build us in return. So, let’s be aware of what we create in our mind. 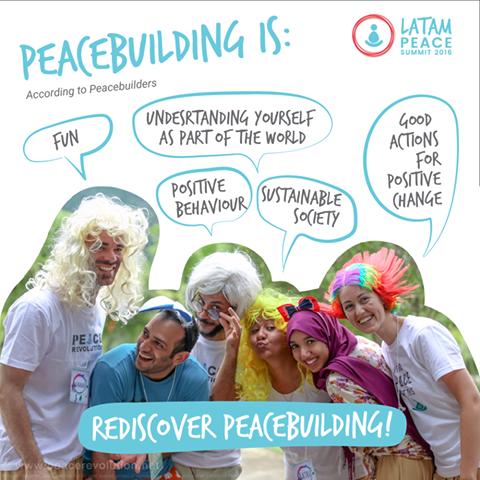 The LATAM Peace Summit 2016 that is going to take place in Mexico, is a great opportunity to delve deeper into our voyage of self-discovery. Don’t miss it!